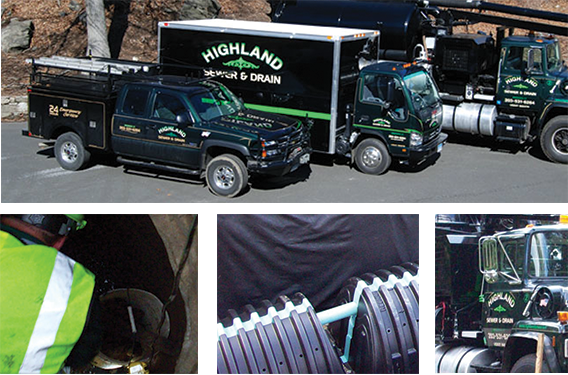 Highland Sewer and Drain is a family owned and operated company. We are a full service company working in all facets of the sewer and drain industry. Highland works efficiently with the use of modern equipment and highly skilled technicians. We take the time to do the job right the first time. Highland Sewer and Drain Service is committed to our high safety standards and procedures. This was reflected in our recent insurance carrier audit where we received an A+ rating for safety and operations. "I just wanted to thank you for your prompt service..."
I just wanted to thank you for your prompt service on a difficult Saturday night. Our drains had stopped working and our tenants could not run any water or use their toilets. You came to our house and quickly determined the reason for the stoppage. At the time we were unaware to the extent of the problem, because prior to this we had been serviced by other companies that had not resolved our problem. Because of your prompt service, quick analysis and resolution to our problem, our tenants did not have to move out for the evening which made for very happy tenants. Also, the follow-up work you did eliminated the need for costly excavation work. We will happily work with you for ongoing maintence. "After having a severe basement water problem..."
After having a severe basement water problem, a call to Highland Sewer and Drain proved to be most satisfying. This is an owner-operated company with high tech equipment and professional staff. Our problems were diagnosed and corrected, and upon completion all clean up and yard work was returned to its original state, as if nothing had been touched. It has been a pleasure doing business with Highland Sewer and Drain and recommend them highly to all who may be in need of their services.